Seventy-three years ago, on 27 January 1945, the Red Army liberated the last survivors from the Auschwitz-Birkenau death camp. On this day we honor the victims of Nazism, including Holocaust victims from the Jewish community, from the Roma and Sinti communities, from the communities of sexual minorities, and from all other groups who were targeted for special persecution by the Nazis and their collaborators. Romani and Sinti people were targeted by the Nazis for genocide because of their ethnicity and were almost completely annihilated in some parts of Europe. This part of the history of the Holocaust and the Second World War is often forgotten. We Roma and Sinti who have inherited the legacy of this history shall never forget it!!! Na bistren!! 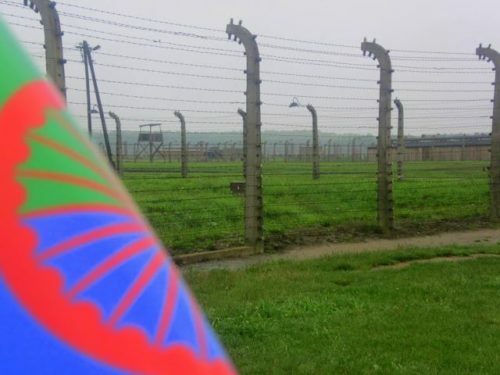 It is high time, as we progress toward the middle of the 21st century, that all of Europe fully recognise the horrors of its past, namely, the more than six million European Jews and the hundreds of thousands of Roma and Sinti specifically targeted for genocide, with few survivors. European societies today need to hear the stories of the heroes, including Romani heroes, who resisted the Nazis. We need to listen to Holocaust survivors tell the stories of all those who did not survive. We must listen not just to honor the past, but most importantly to resist the dehumanisation that poses a serious threat to the democratic order in many European countries, especially in Central and Eastern Europe. Europe is in danger today of failing its moral obligation to uphold the dignity of all human beings and to prevent a recurrence of the Nazi era, which began by exploiting the loopholes that exist in any system based on competition for the democratic vote. We must mobilize resistance and prevent neo-fascist and neo-Nazi political parties from accessing power in legislatures throughout the EU-28. There should be no place for neo-fascists or neo-Nazis in European society, but today they are openly marching in the streets, organizing anti-Romani incitement, and openly brandishing their hatred of all who do not conform to their narrow vision of who counts as European. Europe needs a wake-up call about the danger posed by these anti-democratic forces. All EU Member States must hold appropriate commemorations regarding the Holocaust, including events where the Romani victims are honored. All EU Member States must also properly monitor and prosecute present-day hate crime and hate speech and must report about such crimes targeting Romani people (or those perceived as Roma) to the citizens they serve. The Roma and Sinti face a specific form of racism in European society, that of antigypsyism, which gives rise to a broad spectrum of discriminatory expressions and practices, including ones that are more covert than overt. Antigypsyism is not only about what is being said about Roma and to Roma, it is also about what is or is not being done to combat their dehumanisation. All Europeans have a responsibility to recognize the full impact of the centuries-long problem of antigypsyism, as it is an integral part of why institutions continue to neglect their responsibility to specifically combat the dehumnisation of the European Roma by their non-Roma fellow citizens. By fighting antigypsyism, including within institutions, together we can secure a better place for Roma in Europe. All Europeans have a duty to educate our peers and future generations to make sure that no specific groups are ever targeted for harm, whether by individuals or by powerful institutions. We also have a responsibility to all children in Europe to allow their dreams of a better future, predicated on a Europe that is just, peaceful and secure, to come true and to help them fulfil their dreams and their potential.